Lea Bertucci is a Brooklyn-based composer and performer whose work describes relationships between acoustic phenomena and biological resonance. In addition to her instrumental practice, (alto saxophone and bass clarinet), her work often incorporates multi-channel speaker arrays, electroacoustic feedback, extended instrumental technique and tape collage. Deeply experimental, her work is unafraid to subvert musical expectation. For this performance she will be playing alto saxophone and tapes, using a mixture of material from her recent album Metal Aether as well as new work inspired by a residency in the extreme acoustic environment of Silo City, a series of cast concrete grain elevators in Buffalo, NY. Chloe Alexandra Thompson is a Cree, Canadian artist and curator, living and working in Portland, Oregon. Using Pure Data, Arduino, hardware and voice, Thompson creates unique sonic experiences and expressions through the spatialization of isolated frequencies. Thompson’s work has been shown at Unity Gain: High Density Loudspeaker Array, Corridor (Seattle), Littman and White Galleries, Compliance Division, Bronco Gallery, and Variform Gallery. 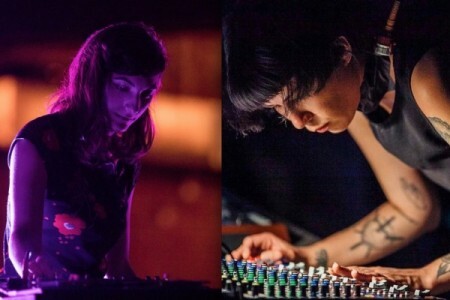 She has also presented in collaborations for Converge45, Disjecta, Out of Sight (Seattle), PICA T:BA:17, SIX for Subharmonic: A Music and Sonic Arts Symposium (PICA), and Nationale.